Keep checking back for the updated 2020 kit. INFO BELOW IS FOR THE 2019 SHOW. CHECK BACK FOR THE UPDATED 2020 KIT. 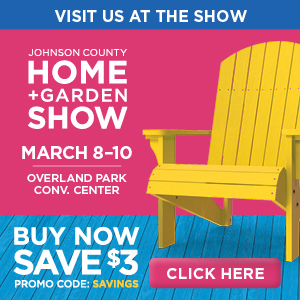 The 2019 Johnson County Home + Garden Show does not print or mail the Exhibitor Kit. All information can be found in the Exhibitor Manual and the links below. Please note that this page is always being updated as new information becomes available. Create a new listing or update an active 2018 listing using the buttons below. Move-in letters with a scheduled time for each exhibitor will be mailed in February 2019. Dismantling of displays is not permitted until 6:01 pm March 10th. See Exhibitor Manual for details. ALL BOOTHS IN THE LOWER LEVEL, BALLROOM, & FOYERS MUST BE REMOVED FROM THE BUILDING BY 10:00 PM SUNDAY MARCH 10, 2019. Exhibitors are responsible for carpeting (required for all booths), tables, chairs, and wastebaskets within their exhibit spaces. Exhibitors can supply their own items or rent from the show decorator. An advanced purchase discount is offered. Click the order form button below for complete details. You many contact George Fern Company directly with any further questions. To purchase any of these services please visit the Overland Park Convention Center website. The City of Overland Park requires that all exhibitors sampling food during the show have a temporary food service permit. To apply for a temporary food permit click on the button below. Application and payment can only be processed online directly with the City of Overland Park. Exhibitors will have to pick the show from a drop-down list that includes shows other than just those run by MPE. Marketplace Events is not selling this insurance and doesn’t profit from it in any way. This is simply a resource for those exhibitors who don’t already have the required insurance coverage per their contracts. They do not have to purchase this. For information regarding sales taxes prior to the event please visit the Kansas Department of Revenue Division of Taxation website. Specific Event Tax Account Number can be found in the Sales Tax Packet below. We have special room rates setup at the following hotels. For discounted rates Click Here to book online. Exhibitors are asked to park in the Black & Veatch Lot during show hours to allow ample parking for customers attending the show. Exhibitors should only park in the 110th St Lot on move-in days. Starting at 5:00 pm on Friday, March 8th we will have a FREE SHUTTLE running from the Black & Veatch parking lot at 11401 Lamar Avenue, Overland Park, KS 66211. This shuttle will continue to run each day show. If you plan to update your booth’s showroom pieces or do not want to ship inventory back to your company consider donating it to Habitat Kansas City ReStore. Jenna and Kari, our friendly ReStore Donor Managers, will be happy to answer any questions about donation criteria, get you signed up for a donation pickup or step you through the easy process. Contact us today before slots fill up. Make sure to increase your sales, leads and awareness by taking full advantage of the Show and our many traffic drivers. As things get a little tougher these days we all need to work a little harder. One way to do so is stand out from your competition. We have a few options to help out! Click Here for the Lead Card. An easy way to track your leads as the show progresses.